Vacuum Pump Market size will surpass USD 6.5 billion by 2025; according to a new research report by Global Market Insights, Inc.
Chemical manufacturing and processing industry growth is a major influencing factor for the vacuum pump sales. Global chemical market will reach close to USD 5.5 Trillion in 2025, with a bulk share accounted by China-dominated Asia Pacific region. China accounted for close to a quarter of the global chemical consumption and will continue to hold sway over the forecast period with the presence of several small and medium scale enterprises catering to the local demand. Industrially emerging nations such as India, Indonesia, Thailand, etc. also offer a promising future to the chemical industry growth. Requirement of clean and dry reaction chambers for critical applications will boost the regional vacuum pump market demand throughout the forecast years. Rebounding of the petrochemical sector after the fallout earlier this decade will also signify the vacuum pump market in the coming few years. These products have versatile applications throughout the upstream, midstream, and downstream oil & gas industry. These applications include oil & gas recovery, field gas boosting, vacuum reactors, etc. With the increase in the crude oil prices, the U.S. oil & gas companies are responding fast by increasing the expenditure in drilling activities. The quick recovery of the country’s shale oil producers after 2014 will also signify the developments in the industry, which will further propel the vacuum pump demand over the forecast period. Vacuum pump market has been segmented, based on lubrication, into dry and wet types. Wet vacuum pumps include water as well as oil lubricated machines and are capable of providing higher pumping speeds than the dry types. This segment will witness growth with a CAGR of around 6% from 2018 to 2025. Based on vacuum pump technology, the market is classified into gas capture/binding, and gas transfer types. Gas transfer products are further classified into kinetic and positive displacement types. Kinetic pumps segment will witness healthy growth, crossing USD 3 billion in 2025. Gas capture/binding products will generate more than USD 1 billion annually by the conclusion of the forecast span. 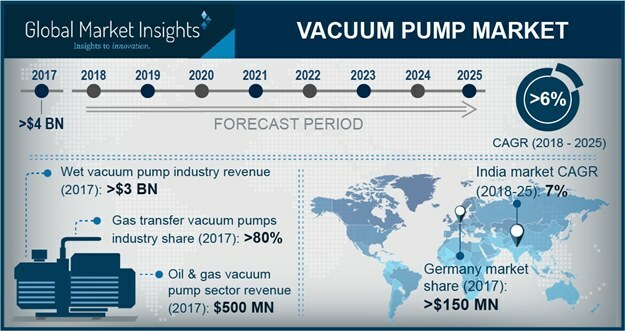 Medium vacuum pumps will dominate the overall industry in terms of revenue, accounting for over USD 2.5 billion in 2025. The typical ultimate pressure range of this product class lies between 100 to 10-1 Pascals and is extensively used in oil & gas and chemical industries. China vacuum pump market value will likely cross USD 2 billion in 2025, witnessing growth with around 7% CAGR. Large presence of chemical and electronics manufacturing companies in the country will boost the regional market through the forecast years. The country also enjoys the presence of several small vacuum pump manufacturers with focus on low cost product development for local end-users. Key vacuum pump market players include Busch, Atlas Copco, Becker, Gardner Denver, Pfeiffer, Ebara, ULVAC, Shimadzu, Agilent, DEKKER, Kashiyama, and KNF Neuberger.